Smart Facts Sundown Naturals' Vitamins To Go makes it easy to stay healthy. No need to guess the right dosage and no need to buy and store several different bottles. 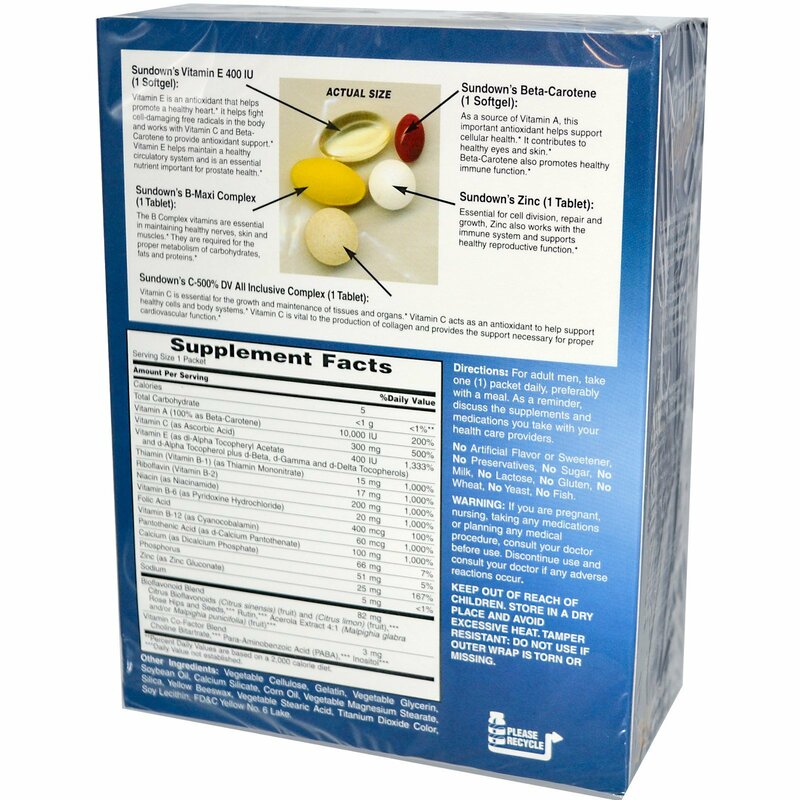 You have most of your nutrient needs in one convenient packet. Sundown Naturals' Vitamins To Go is perfect for anyone on the go. It is great for the daily morning rush, travelers, handy for the office, school or sports. Just take along the number of packets you will need and put them in your pocket or briefcase. 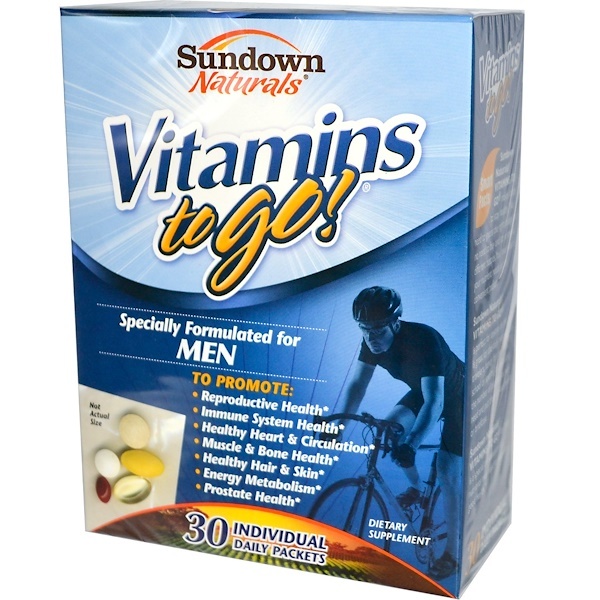 Sundown Naturals' Vitamins To Go for Men is a special combination of nutrients men need to support good health. Vitamin E is an antioxidant that helps promote a healthy heart. It helps fight cell-damaging free radicals in the body and works with Vitamin C and Beta-Carotene to provide antioxidant support. Vitamin E helps maintain a healthy circulatory system and is an essential nutrient important for prostate health. The B Complex vitamins are essential in maintaining healthy nerves, skin and muscles. They are required for the proper metabolism of carbohydrates, fats and proteins. As a source of Vitamin A, this important antioxidant helps support cellular health. It contributes to healthy eyes and skin. Beta-Carotene also promotes healthy immune function. Essential for cell division, repair and growth, Zinc also works with the immune system and supports healthy reproductive function. Vitamin C is essential for the growth and maintenance of tissues and organs. Vitamin C acts as an antioxidant to help support healthy cells and body systems. Vitamin C is vital to the production of collagen and provides the support necessary for proper cardiovascular function. For adult men, take one (1) packet daily, preferably with a meal. As a reminder, discuss the supplements and medications you take with your health care providers. Vegetable cellulose, gelatin, vegetable glycerin, soybean oil, calcium silicate, corn oil, vegetable magnesium stearate, silica, yellow beeswax, vegetable stearic acid, titanium dioxide color, soy lecithin, FD&C yellow no 6 lake. Keep out of reach of children. Store in a dry place and avoid excessive heat. Tamper resistant: Do not use if outer wrap is torn or missing.